This year the City of Cape Town will be participating in the City Nature Challenge from 26-29 April 2019. To win across the board we just need 50,000 observations, 3,500 species and 2,000 observers! The 3 500 species should be the easiest. 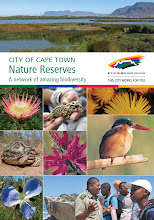 We are the Mother City, the Biodiversity Capital of the World. 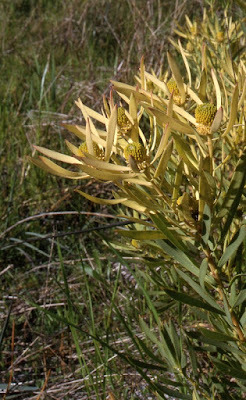 With 3700 indigenous plant species this should be a cake. 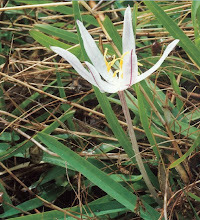 But it is autumn – no annuals, few bulbs, nothing flowering: well we don’t want to embarrass everyone else. But it does mean we are going to have to hunt down our species, and the pics are going to have to be good to make an ID. So please start drawing up your target list and planning your four day’s activities. Don’t forget aliens, and insects, and fungi and our marine life! They all count: just no selfies, dogs or cats! And don’t worry about duplication. 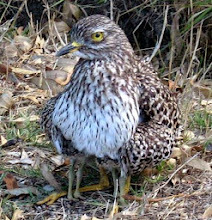 The game is to take them again if you see them after 500 m. This is about data for monitoring: where do our species occur? The City will be opening their nature reserves for the competition, so if organizing bioblitzes, walks, tours, show-and-tell or fun activities is your forte then perhaps focus on this target. So feel free to join in and help out, especially if you are affiliated to CREW or WESSA Friends. Scouts and Guides are also on board. The competition is worldwide, and over 150 cities are competing in 2019. All will be trying to showcase their nature and encouraging citizen scientists (that is you!) to participate in this endeavour. For four days after Easter people all around the world, interested in nature, will be putting their biodiversity onto the map. The City Nature Challenge is organized by the Natural History Museum of Los Angeles county and the California Academy of Sciences, and run on iNaturalist which is supported by the California Academy of Sciences and National Geographic. The competition will run just after Easter, from 26-29 April 2019. Please diarize these dates now and choose your weapons! 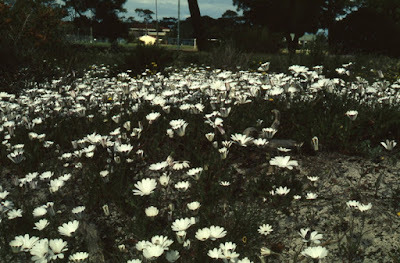 The City of Cape Town Biodiversity Branch are fully on board. The aim is to open and showcase our nature reserves to schools and the public for the four days. this is an opportunity to recruit new iNatters, to reach out to the public and to get everyone excited about our fauna, flora and fungi. At the same time we will collect data for monitoring and documenting species in our national park, open spaces and city. The data will be used by reserve managers to plan and run the reserves more efficiently, and by Red List staff at SANBI to evaluate the conservation status of our species. 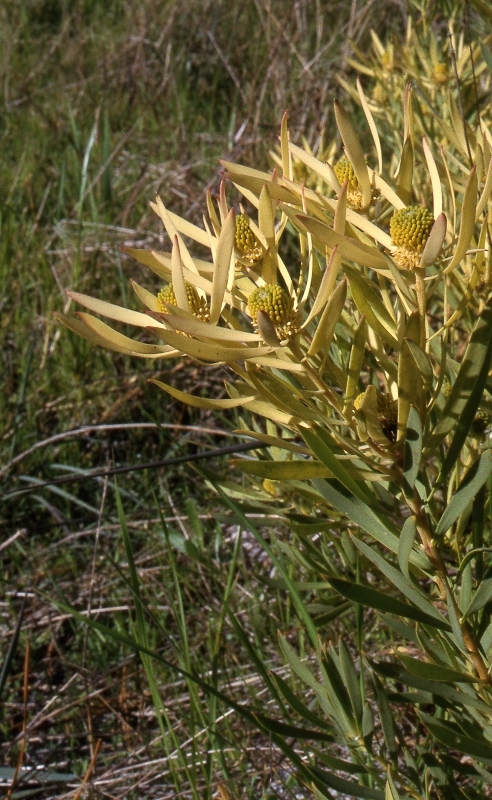 To be involved in this project, all you need do post as many biodiversity observations made within the Cape Town Metropole over the four-day period, as possible. If you have not already done so, load the iNaturalist app onto your smartphone. The app will handle all the things needed for an observation. You merely have to find something living, and take a picture or two, and upload. The focus over the four days is observe, observe, observe: don’t worry about making identifications - there is not time. Of course, you can still do it the old way with your camera. 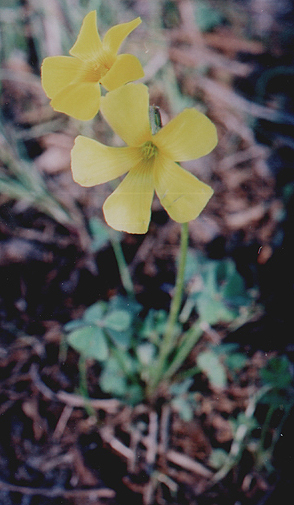 But all observations have to be loaded by 2 May, so that we can identify them. Your observations do not only have to be from a nature reserve or the national park – beaches, urban parks, trails, waterways, gardens, school grounds – anywhere will do, where there is something exciting to photograph (as long as they are from the Cape Town Metropole – see the map on the project for what is in). ● No people please, and definitely no selfies. Your domestic dogs and cats do not count either (but feral ones do!). Ideally wild animals and plants please, but if in doubt, snap it. ● Only observations made within the city limits between midnight at the start of 26 April and midnight at the end of 29 of April 2019 (local time) will count. ● Only one species per observation. ● Only post one observation for a species at a place at a time, with place being about 500 m.
As we approach the event, we will post more information and material about the City of Cape Town Nature Challenge 2019. In view of the upcoming iNaturalist City Nature Challenge from 26 – 29 April, a number of free basic “iNat 101” training sessions to help beginners come to grips with the iNaturalist platform have been arranged. Below is a schedule of planned dates for these sessions, which will all take place in the morning. Starting times may be affected by the Load Shedding schedule and will be confirmed closer to the time. Please RSVP to Gigi Laidler at G.Laidler@sanbi.org.za as soon as possible if you wish to book for a session, providing a phone number in addition to your email. Please note that you will need to bring your laptop or tablet, your Smartphone and a flash drive with images of a couple of observations that you can upload. Appreciate the successful plants in your garden, celebrate them even though they might not be what you would ideally like and allow plants to grow where they want to rather than when you put them- should they decide to self-seed in your garden. They are more successful/hardier where they choose to migrate to themselves. Measure how much water your usual watering time puts into a measuring jug….. then dig into your soil to see how far that amount of water penetrated…… then adjust so that you are getting to a depth of at least 60cm for small plants and deeper for larger shrubs and deeper for trees, you want to encourage your plant’s roots to grow down where it is cool and hopefully moist, not up in the shallow soil layers where it’s hot and dry. Once you know how much water you’re actually using and how deep the watering you do penetrates in your garden’s soil you can manage your water much more effectively, even if that means having a ‘rain event’ of watering once a week rather than sprinkling watering every second day. Don’t waste: Use recycled water, catch all the rain with berms/gullies/planting hole basins, don’t let water escape your property down storm water drains- do everything you can think of to get as much water back into your soil as possible- SOIL is the best ‘water reservoir’ that exists for us gardeners. Mulch, mulch, mulch - with whatever you like and can afford. Just cover and protect your precious soil. 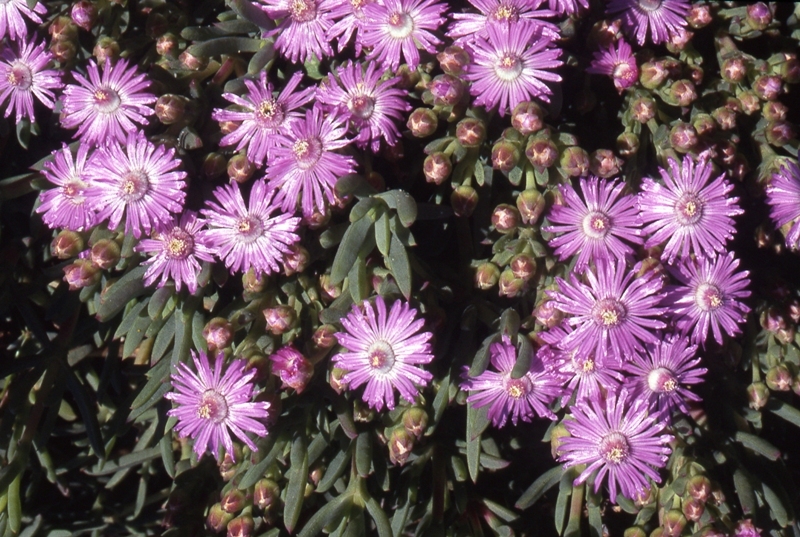 Cherise Viljoen, Senior Horticulturist at Kirstenbosch and Manager of the Kirstenbosch Wholesale Nursery, will be giving a talk on Drought Gardening at the AGM of the Friends of Meadowridge Common. 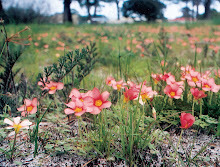 Well-known for her gardening advice show on Cape Talk radio, a talk by Cherise is not to be missed! Join the Friends to find out how to make a fabulous waterwise garden. The AGM is on Monday 25 February at 19h30 in the Meadowridge Library, Howard Drive, Meadowridge. Everyone is welcome – and Cherise is willing to answer drought-related gardening queries. There is secure parking, and tea and cake is served afterwards. 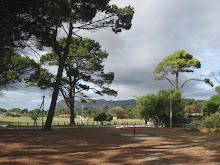 For more information, please contact Roger Graham, Chairperson of the Friends on 021 715 9206, or visit their webpage at http://meadowridgecommon.blogspot.com/. Request for volunteers in an Urban Pollinator Research Project. PhD candidate, Peta Blom, is recruiting volunteers to make observations of beetles in gardens in Meadowridge. 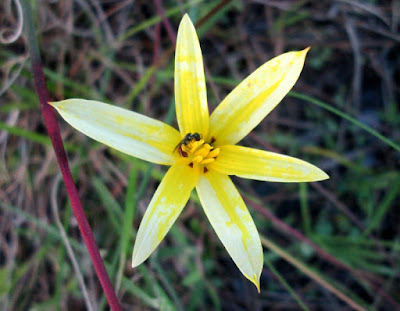 She is gathering data on all flower-visiting beetles, but she is particularly interested in monkey beetles, which are an important family of pollinators with rich diversity in the Cape Floristic Region. Recently she trapped some really interesting monkey beetles in Molinera Way, Meadowridge (you might have seen her blue, yellow and white dishes hiding in the grass when you took your dog out). Peta wants to know which beetles are using gardens (why) and how far they are travelling from where I trapped them. The data you collect will be used in her Ph.D. and she hopes to be able to provide insight into landscaping and urban design for diversity. 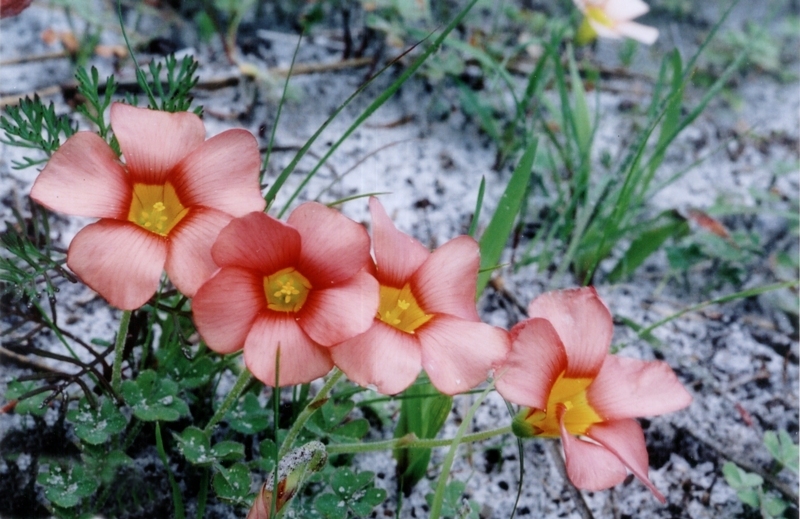 "The United Nations have declared Cape Town as the most biodiverse city in the world. Normally this is described in terms of the amazing flora in our region, but it is also diverse in other creatures including, mammals and insects. 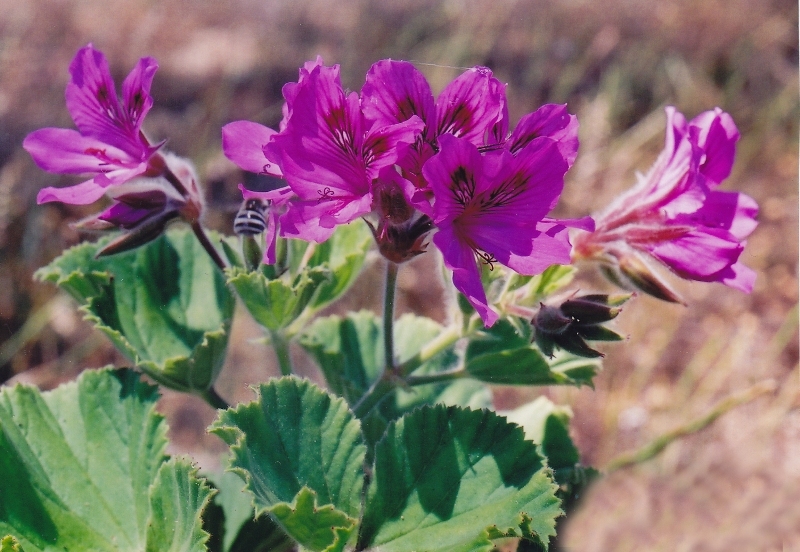 The Western Cape has the highest diversity of monkey beetles in the world and many of our most prized flower species (in particular the Iridaceae) have co-evolved alongside the rich monkey beetle diversity and rely on them for seed production. 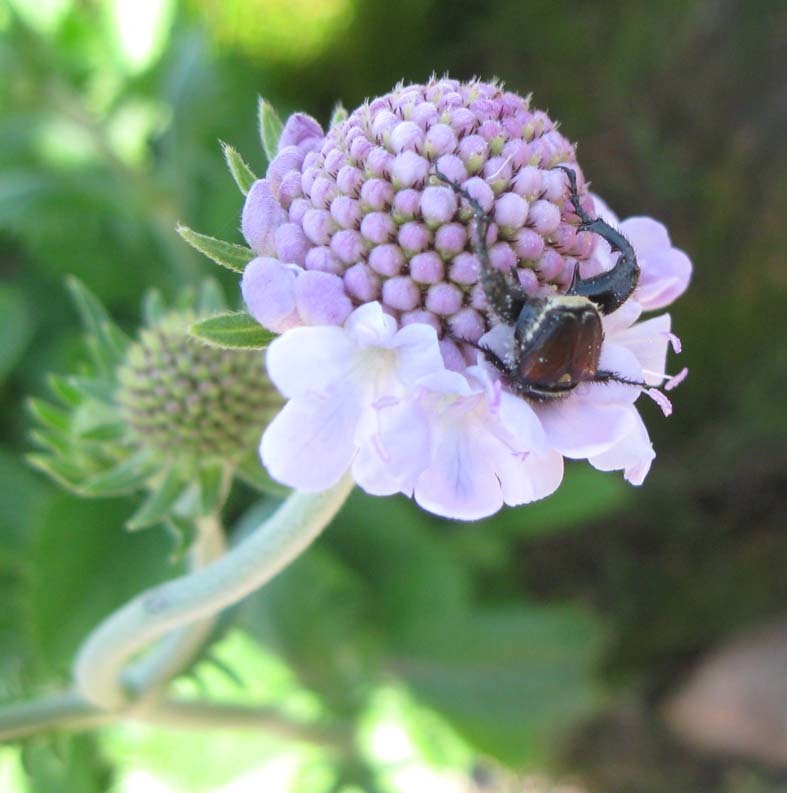 This project seeks to understand to what extent private gardens are providing habitat and foraging ground for monkey beetles – particularly those gardens around fragments of natural vegetation as can be found on Meadowridge Common. 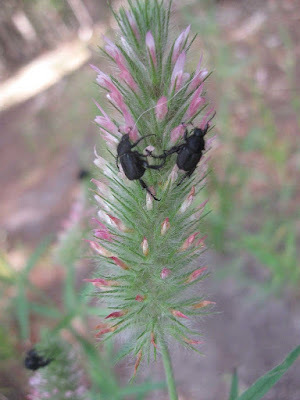 The beetles are in the adult stage of their lifecycle in spring and climb into flowers to find and compete for a mate. The project will conduct observations over two spring seasons in 2018 and 2019, with the pilot starting in October 2018. 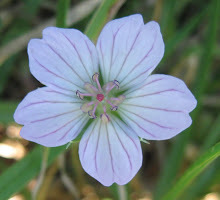 I am calling for volunteers in Meadowridge to participate in making weekly observations of the flowers in their gardens over a period of 6-8 weeks during spring. Each observation should take about 15 min and will include documenting the beetles in flowers in a 16 m2 area in the garden along with variables such as the weather conditions of the day and garden orientation. This study is the first truly urban study of monkey beetle populations to be conducted anywhere in the world." To sign up, or just to find out more, please write to Peta Brom at brompeta@gmail.com. 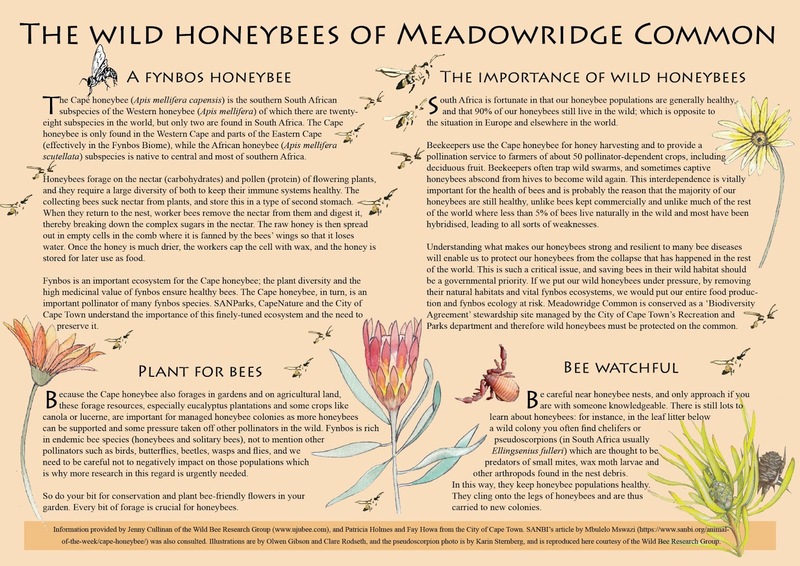 For the love of Wild Bees is the subject of our next talk on Monday 29 October 2018 at 7h30 pm in the Meadowridge Library, Howard Drive, Meadowridge (click here for Google map directions). 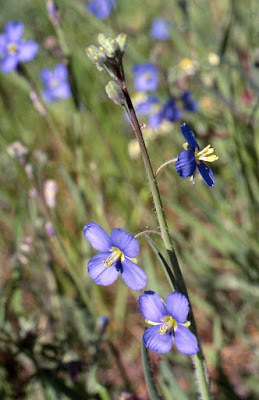 Our speaker is Jenny Cullinan of the Wild Bee Research Group (see their web page here, as well as their Facebook Page). Jenny will speak about the important role bees play as a keystone species in the fynbos region and why we need to protect all of our wild bees. She will show the amazing world of bees and, of course, their beautiful fit with flowers. Jenny has just returned from a conference in the The Netherlands and as this will be her first talk since returning, we will hear all about what is happening in this field oversees. For more information, please contact Roger Graham, Chairman of the Friends, at 021 715 9206 or email us at Meadowridgefriend@gmail.com. Entry is free, everyone is welcome, and safe parking is provided. Tea, coffee and cakes will be provided. Recent clearing operations on Meadowridge Common were brought to a halt when the workers discovered a wild honeybee colony. Although this colony was known to some of the locals, it was an exciting find for many conservationists. One of the visitors drew our attention to the colony as she was concerned that it had now become exposed as half the bush it was in had been cut away. 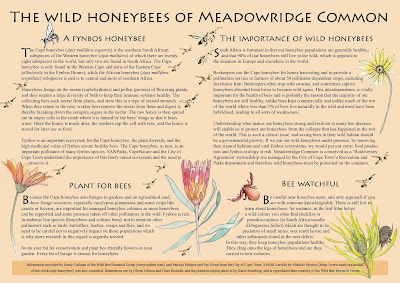 The Friends of Meadowridge Common were directed to Jenny Cullinan of the Wild Bee Research Group and with her help, and input from The City of Cape Town, we decided to make a poster to put up on the Common. If you would like to download a PDF of the poster, click here. Visit the Wild Bee Research Group web page here, as well as their Facebook Page. 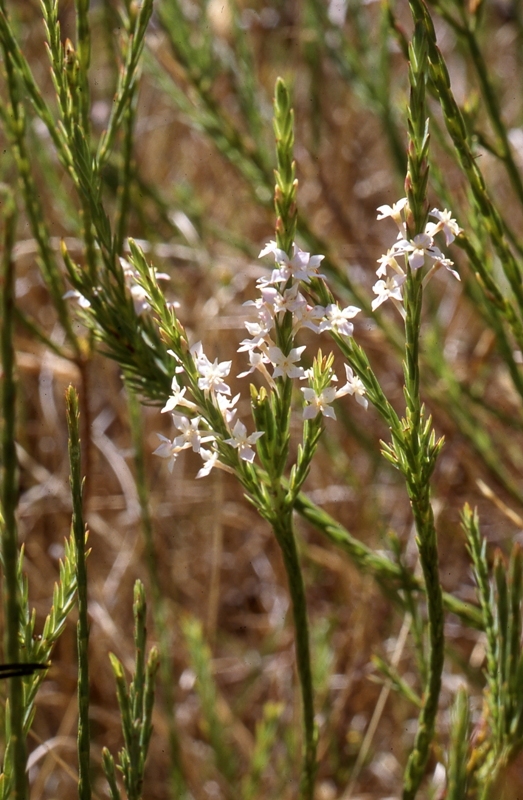 At the recent AGM, Fiona Watson, Botanical Officer of the Friends of Meadowridge Common Committee, gave a talk on the Meadowridge Common plants which have survived the drought that is gripping Cape Town. 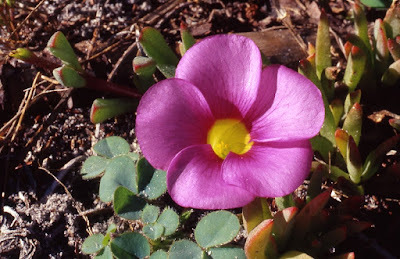 She presented a slideshow of her photographs of these plants, many of which are available from nurseries. 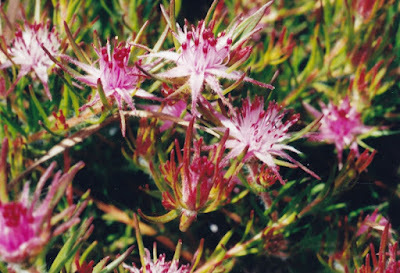 Fiona recommended that gardeners in the area try to change from water-needy plants to these hardy indigenous plants that are suited to hot dry summers. 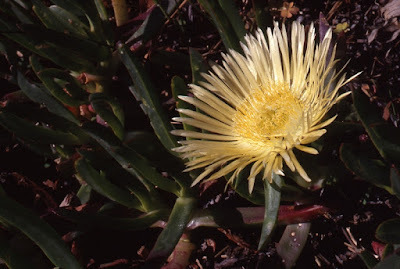 A link to SANBI’s PlantZAfrica website with its wealth of information about our indigenous plants and how to grow them is provided where possible. 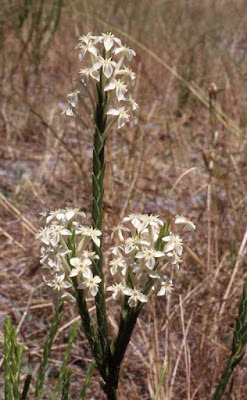 Just click on the plant name for the link. 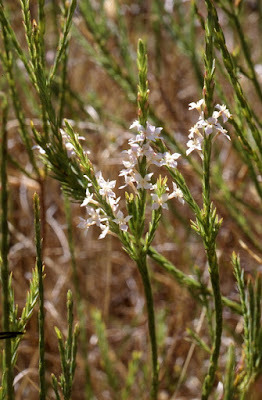 Ruschia geminiflora is Redlisted as Vulnerable. 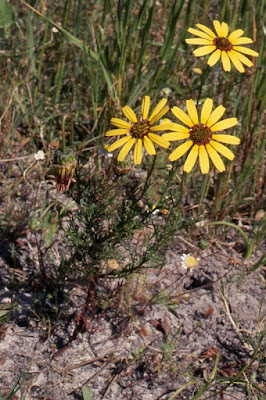 Dimorphotheca pluvialis grows very well on the common in the spring, even though historically it didn't occur here until someone sprinkled some seeds. 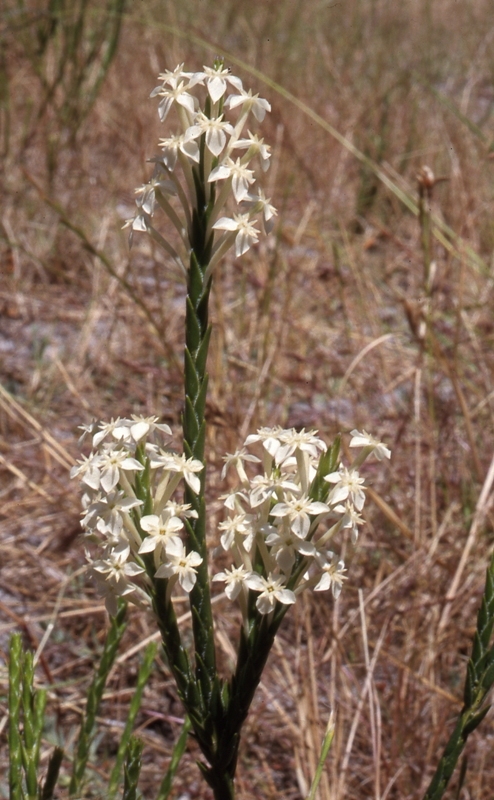 Serruria glomerata is Redlisted as Vulnerable. Further information can be obtained from your local nursery, and many of Cape Town's specialist indigenous nurseries like Good Hope Gardens Nursery, Dr Boomslang Indigenous Nursery and the Kirstenbosch Garden Centre tel: 021 797 1305). Possibly the best source of local Cape Flats Sand Fynbos plants is from Caitlin von Witt who works with the City of Cape Town amongst other organizations involved with the rehabilitation of Cape Peninsula fynbos. Contact her to set up a visit to her nursery here. I highly recommend Caitlin’s Facebook page too. Specialists at Kirstenbosch are also willing to give you information about growing indigenous plants. Click here for contacts.